Ever Bilena Ultra Matte Water Proof Lipstick Review and Swatches | Top Beauty Blog in the Philippines covering Makeup Reviews, Swatches, Skincare and More! "Want to look innocent? Elegant? How about sassy? Be everything and more with Ever Bilena's new EB Ultra Matte Lipstick- a waterproof, long-lasting matte lipstick that provides intense pigment load and maximum smooth coverage." Hello, friends! 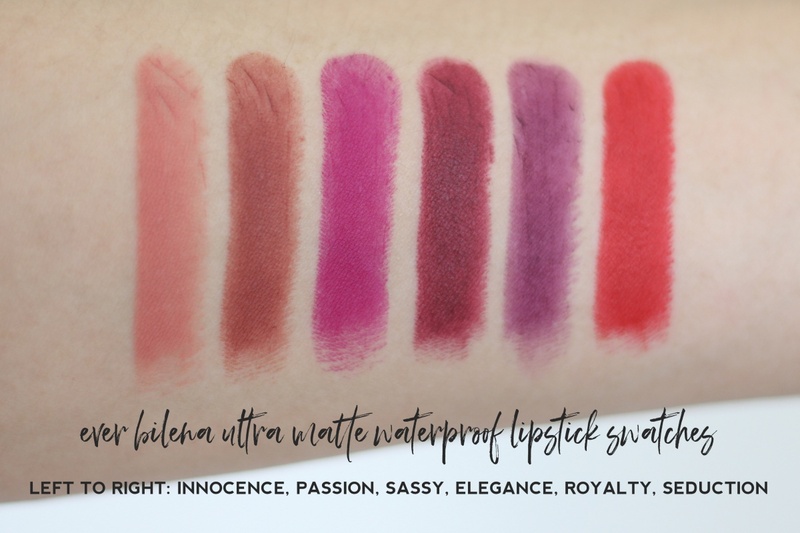 It's been quite a while since that last time I posted a product review + swatches here on the blg and to be hones, I missed it – that's why in today's blog post I wil be sharing with you my thoughts on the new Ever Bilena Ultra Matte Water Proof Lipstick. The packaging is really cute in my opinion. I love that they coordinated the color of the packaging to the color of the lipstick itself making finding the shade that you need a lot easier. The cap is also very tight that's why you are 100% sure that no dirt can go into the product. One thing I have noticed is that these lipsticks have different formula – some are smooth and easy to apply, some are not which is quite disappointing for me. I didn't had any problem applying and using the shades Sassy, Passion, Elegance and Seduction. They looked and felt really nice on the lips – not patchy as well. Innocence and Royalty on the other hand disappointed me because they aren't as pigmented and as easy to work with compared to the rest. As for longevity I'd say it lasted for about 4-5 hours. The darker shaded left a really nice tint when it faded that's why it the fading isn't really that obvious at the end of the day. As for its "waterproof" claim I'd say this lipstick isn't really waterproof but compared to the other matte lipsticks I have tried this one were less likely to transfer or smudge especially when eating / drinking. Overall, I impressed with these new matte lipsticks from Ever Bilena! I highly recommend them (except innocence and royalty) if you are looking for some nice matte lipstick that's very affordable and perfect for everyday use. They seem amazing. Love the colours! son super chulos, me encantan! Love the colours! Nice tips!! The colours look amazing - the packaging is pretty cool too.